NETWORK UPDATE: THE GRAMMY AWARDS lost half a point after timezone adjustment, ending up with an 8.3 rating, well below last year’s final 9.9. In addition, NBC’s run of THE HUNGER GAMES gained 0.1. THE WALKING DEAD (AMC) returned to devour everything except the GRAMMYS, with a 7.98 rating. That was down from the 8.17 for the February 2014 midseason premiere, although hardly anything to complain about. The giant lead-in helped BETTER CALL SAUL premiere to 3.43, the highest cable premiere ever, and TALKING DEAD, airing after SAUL, was at 1.49, which was far below last year’s 3.04, but that episode aired directly after WALKING DEAD. 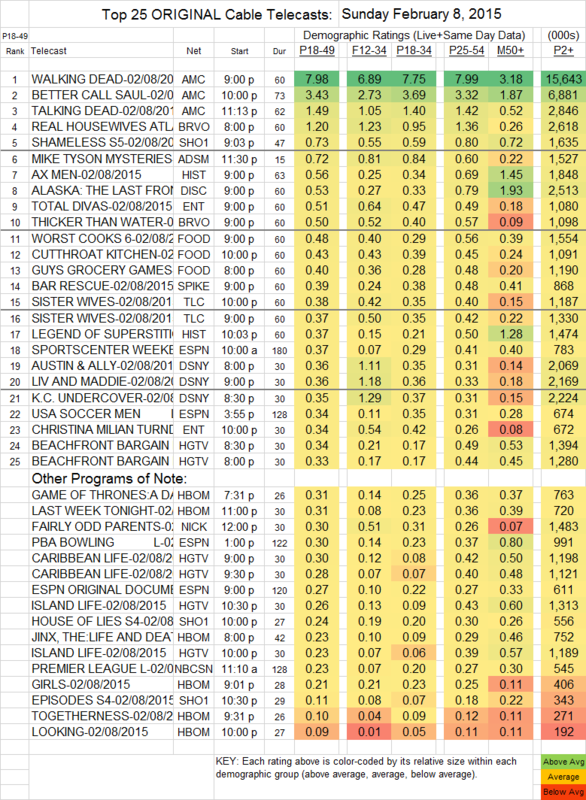 Nothing, of course, touched AMC on Sunday, but Bravo’s REAL HOUSEWIVES OF ATLANTA was at 1.20 (lead-out THICKER THAN WATER was at 0.50). Showtime (which, remember, is only 1/3 of US homes) was next with SHAMELESS, up 0.13 from Super Bowl Sunday to 0.73. HOUSE OF LIES gained 0.06 to 0.24, and EPISODES was down a tick to 0.11. HBO had taken last week off, and its new docudrama series JINX premiered at 0.23, after which GIRLS returned down a tenth to 0.21, with TOGETHERNESS down 0.11 to 0.10, and LOOKING down 0.06 to 0.09, before LAST WEEK TONIGHT perked things up with its 2015 premiere at 0.31. MIKE TYSON MYSTERIES (Adult Swim) lost 12 to 0.72. On History, AX MEN was at 0.56, and LEGEND OF SUPERSTITION was at 0.37. Discovery’s ALASKA: THE LAST FRONTIER was clobbered for some reason, down three-tenths to 0.53. TOTAL DIVAS (E!) dropped a tenth to 0.51, with CHRISTINA MILIAN down 0.07 to 0.34.